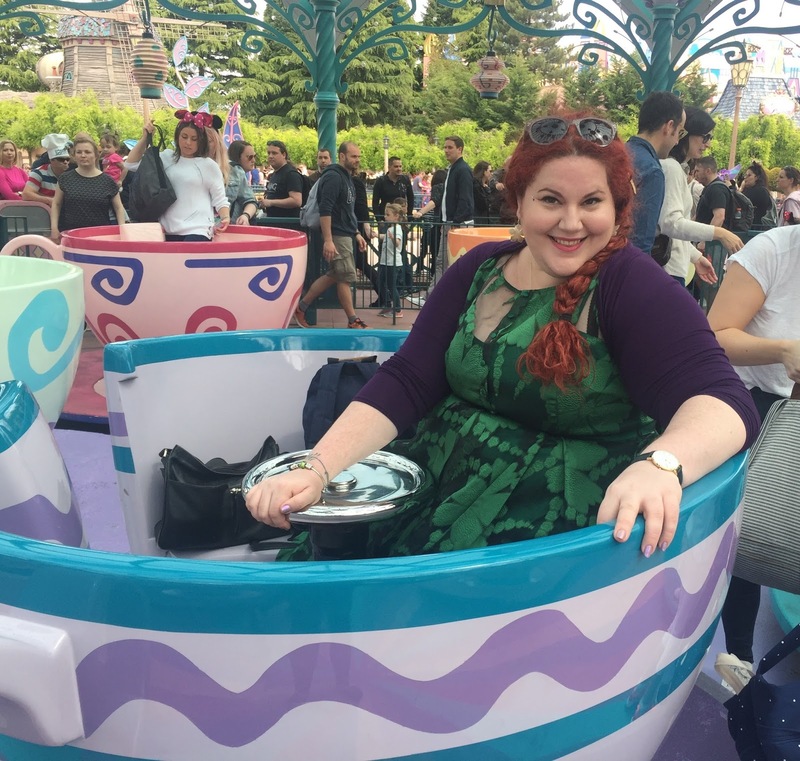 While on a recent trip to France my mum and I went to Disneyland Paris, because you're never too old for Disney! I decided I wanted to do a Disney inspired outfit, because why the hell not, and couldn't resist going for a plus size Ariel look because, well, #lifegoals. It was quite an emotional day for me. But in a really good way. I went to Disneyworld in Florida when I was 12. My dad took my brother and I for a week of crazy fun. It was absolutely incredible, and I think he may well have loved it more than we did. My dad died very suddenly when I was 15, and to this day that trip contains some of the strongest and best memories I have with him. Riding the Hollywood Tower of Terror and dad laughing at the sheer joy and terror on both of hour faces as the lift suddenly dropped several floors, whoops of excitement as rollercoasters rushed towards each other on Space Mountain, eating candy floss and wearing mouse ears. Disney is really strongly connected to that time with my dad, and the great memories warmed me. When you lose someone so young, it can become a struggle as you get older to really connect with how they made you feel or who they were, and this brought so many of the very best memories back. Magic. It was so special to make new memories with my mum in Paris. It was an awesome day out. After a bit of a daunting start (my mum was definitely getting her love of rollercoasters back after a 30 year hiatus) we did all the scariest rides because those are totally our jam. We wondered around the picturesque turn of the century American style town, rode the teacups, took loads of photos, and just enjoyed the majesty of it all. And my mum was ridiculously pleased with her adorable leopard print ears. The one thing I was a little concerned about was fitting in the rides. As a plus size person this is a very real concern. Rides are not always made with all sizes in mind at all, and having queued for an hour it's going to be more than a little upsetting if you get to the front of said queue only to find (in front of a crowd of people) that the security bar can't click into place. There were several rides with disclaimers at the beginning saying that not all people would fit into them. This made me nervous, but I decided to try anyway. There was a ride where it was quite a squash (the aerosmith rollercoaster - not really worth it as it was really short) but I fit into all of them. However, a couple of sizes bigger and I think it would have been a problem. Which is really rather disappointing - there are people a lot bigger than me, shouldn't they be able to ride too? And how does this work in the States? Where their average citizen is bigger than the average European citizen? Do they make allowances for this? 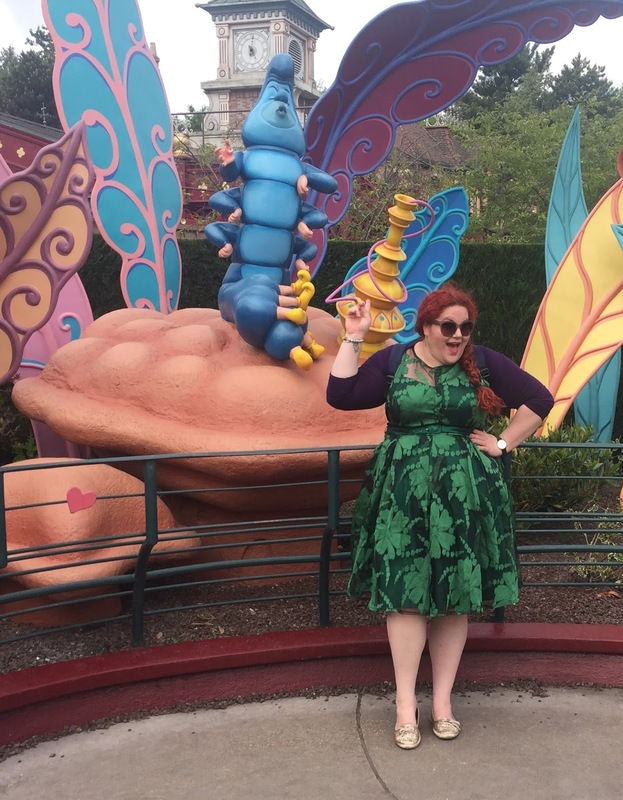 I wanted to do an outfit inspired by Ariel, so I very patiently (it was hard) saved this Voodoo Vixen Maggie dress for the occasion because it's perfect mermaid tail green, and despite the formal fabrics (a taffeta under layer, and a patterned organza overlay) it is really comfortable. Plus the perfect length and fit for me (I am wearing a 3XL, which is a size 24). I popped a purple shrug over the top (just one I picked up for super cheap on eBay) as a nod to the wonderful purple shell bra. I wore my trusty chub rub shorts for comfort and because I knew it would be a day of walking (comfy shoes are a must) and I accessorized with gold - gold sparkle shoes, gold shell bag, gold starfish hair clip and shell earrings. I felt pretty cute! On Instagram I've seen loads of lovelies at Disneyworld in Florida and Disneyland in California in cute, creative Disney inspired outfits. I'm not sure they've got the memo in Europe though. There were loads of mouse ears and Disney prints but I was pretty much the only one dressed quite this fancy. I got a lot of looks, but they weren't bad looks at all. A lot of compliments too, many from the staff who I think enjoyed my creative interpretation. And I spend a lot of my time a little overdressed so nothing new there. You can follow me on my social channels for outfits, chat and random nonsense - Facebook, Instagram and Twitter. So glad you had such a lovely time & it brought back such special memories. That dress is gorgeous. You really suit those colours. Yeah it's a little nerve racking for sure. And frustrating because it's so unnecessary!